Forward to 2B Who shoud be Screened? Back to 1K Future Developments in Lung Cancer Screening..
A police officer pulled me over and said, ‘papers….’ I said, no thanks, I’ve got a bong. This Section includes an explanation of the first-line imaging process used in lung cancer screening, with the second-line imaging techniques that may be used. Note: All references are to highly cited or ‘authoritative’ research and review publications. In addition there are links to the original journal articles, where possible. The most recent References and sources of Patient Information are at the end of each Section. X-Ray: where shooting people is not only okay, but is your job. Computed tomography (CT) is a radiographic imaging technique that uses X-rays to give high quality, three-dimensional (3-D) images of the lungs. Low-dose ‘spiral’ CT, or ‘helical’ CT, is rapid and sensitive in detecting small lung lesions and is used in screening for lung cancer. Recent studies have shown that screening for lung cancer using CT is more sensitive than standard lung screening methods (i.e., chest X-ray with sputum cytology). 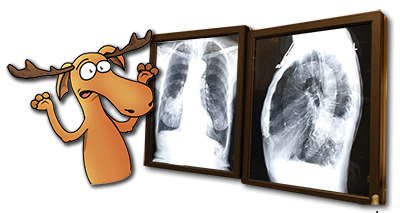 Chest X-rays take images of the lungs from the front and the sides. A CT scan of the lungs takes cross-sectional images that allow the radiologist to see the entire lungs, from the top to the bottom. The use of 3-D imaging, allows CT used in lung screening to measure the growth of tumors in all directions rather than just at their widest point. A 3-D view allows the radiologist to track changes in the volume of the lung tumor. In addition, there are other types of CT scans. Some of these CT scans may be considered for lung cancer screening. For example, standard CT, multi-detector CT and electron-beam CT. The above CT imaging techniques are often used to follow up lung abnormalities detected on initial screening. Spiral CT and multi-detector CT devices have the benefit of lower radiation emissions during lung scanning. I bought a new book today called ‘X-Ray Vision for Beginners.’ I’m having a look through it now. The outcome of the National Lung Screening Trial (NLST) showed that early screening of asymptomatic individuals, who were at risk of developing lung cancer, could detect early-stage lung cancer. Early detection was shown to lead to a 20 % decrease in lung cancer mortality and a 6.9% decrease in all-cause mortality. The NLST was of value in developing the recent recommendations produced by the U.S. Preventive Service Task Force (USPSTF). The recommendations are to screen individuals who are between 55 and 79 years old and who have a cumulative smoking history of at least 30 pack-years, and who still smoke or who have given up smoking in the past 15 years. What exactly is a ‘pack-year’? It’s a way of working out the number of cigarettes a person has smoked over time. If you smoke or have ever smoked (not including in bed) click on the link above to find out your own pack-years. 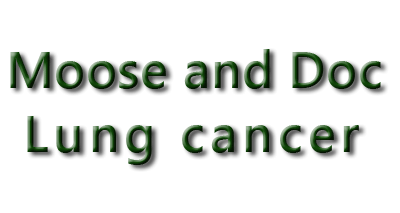 Low-dose, non-contrast, spiral (helical) multi-detector CT or LDCT imaging is the first-line screening technique for lung cancer. The lung CT image obtained allows the radiologist to examine different levels, or slices, of the lungs, using a rotating X-ray beam. LDCT can detect smaller lung lesions than standard chest X-rays can. CT lung screening is non-invasive and painless and takes just 30 seconds. The patient lies on their back on a multi-slice, spiral computed tomography (CT) scanner table, with their arms above their head. The patient lies still and holds their breath for the CT imaging. During most of the imaging procedure, the scanner is open at the back and front. The lung cancer ct scan only takes about 5 minutes and a technician will be around. A CT scan does not use any contrast or dye. Figure 2.1. The Use of LDCT Imaging of the Lung. Why is it that the colder the CT scanner table, the more of your body is required upon it? Forward to 2B Who shoud be Screened? . Back to 1K Future Developments in Lung Cancer Screening..